…that rain stopped play! We had already been diverted off Plan A before we set foot in India due to lack of water on our original route. Plan B was a good one, a route which I knew well so I wasn’t too concerned about the changes and Bex and our Love Her Wild group were happy to go with the flow too. 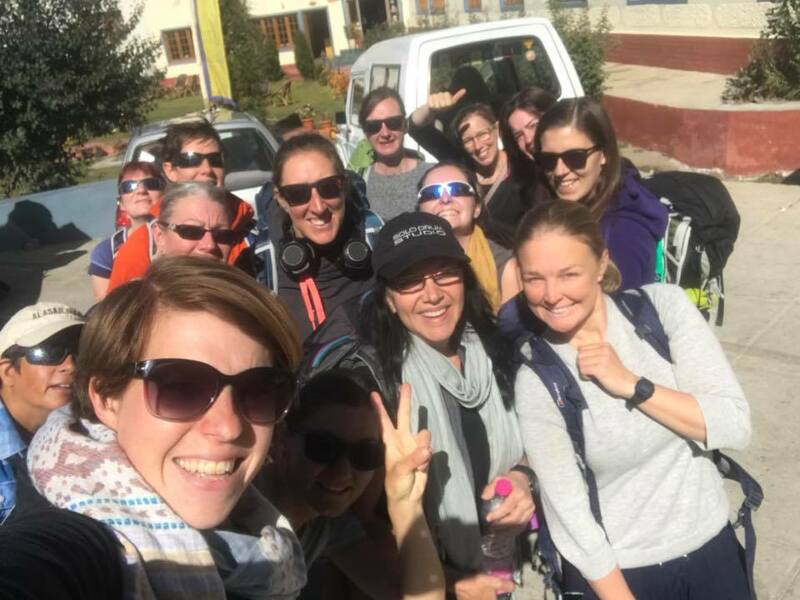 We landed in Leh on a bright and sunny morning, all bags and bodies intact, and as we waited for our transport to head round to us I pointed out Stok Kangri to Bex and a few of the ladies in our all-female group of 16. ‘Ooohhhhhh’ they went, ‘she looks amazing’. ‘She is’ I said. 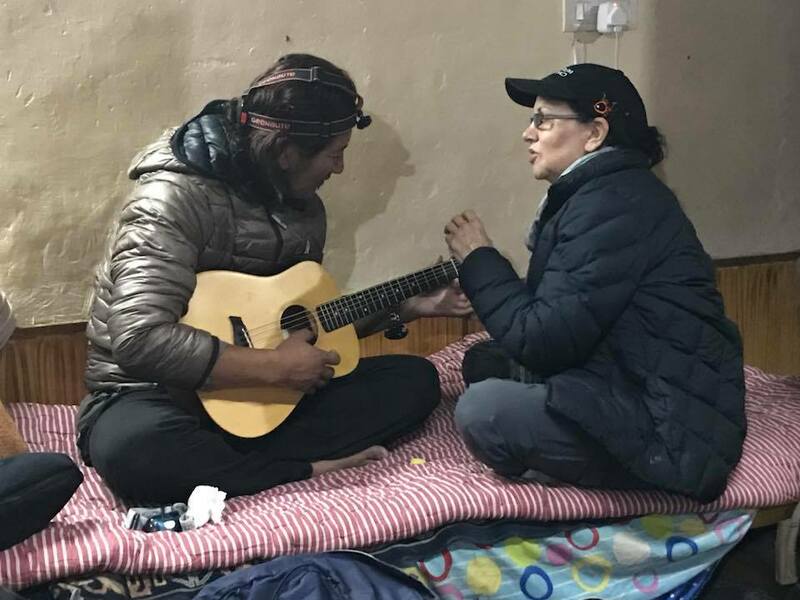 I love this expedition, a real immersion into the village culture and then the wilderness of this local peak to Leh. It’s amazing how close you can be to civilisation but still feel so far away. 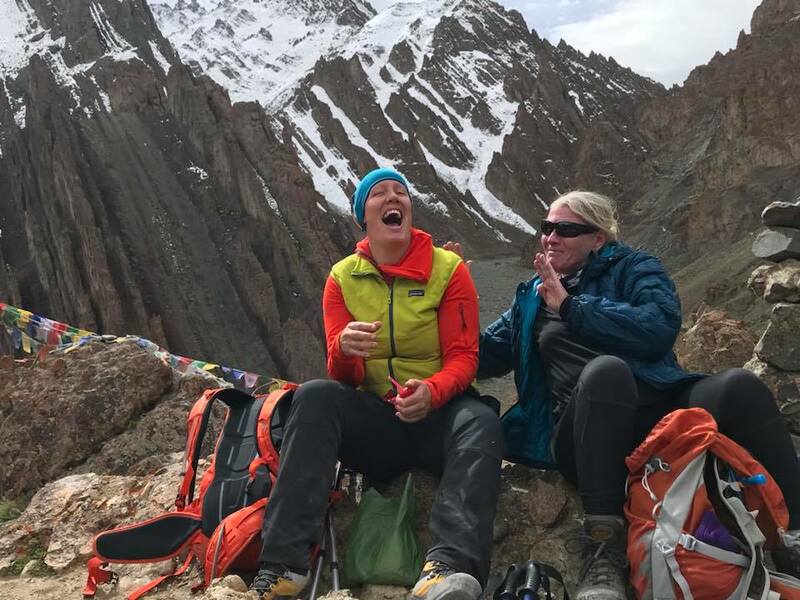 Formalities sorted, hotels checked in to, lunch inhaled and then a meet up with Rolfe’s group who had just arrived back from their expedition on Stok with tales of hardship and beauty, we were all becoming excited to just get out onto the mountain in a couple of days’ time. The forecast looked great, cold and clear, but as we know a weather forecast is called a forecast for a reason, and not a weather actual, and we always have plans up our sleeves ‘just in case’. Little did I know then that we would be gradually sliding down the Planning Alphabet. We set off from the comfort of town 2 days later on a bit of an overcast day via the majestic drive along the Indus to its confluence with the Zanskar River. The rivers were really low and the usual line in the water where the two rivers rush together was missing, just a gentle meeting of minds rather than a full-on torrent. What a difference the next 24 hours would make. Settling into our first camp in Chilling, we said fond hellos to our crew. Topcheng, our incredible cook and Gyalpo, Ritzen, Depan and Ashang who ran around a lot doing everything else and making sure we didn’t go without. 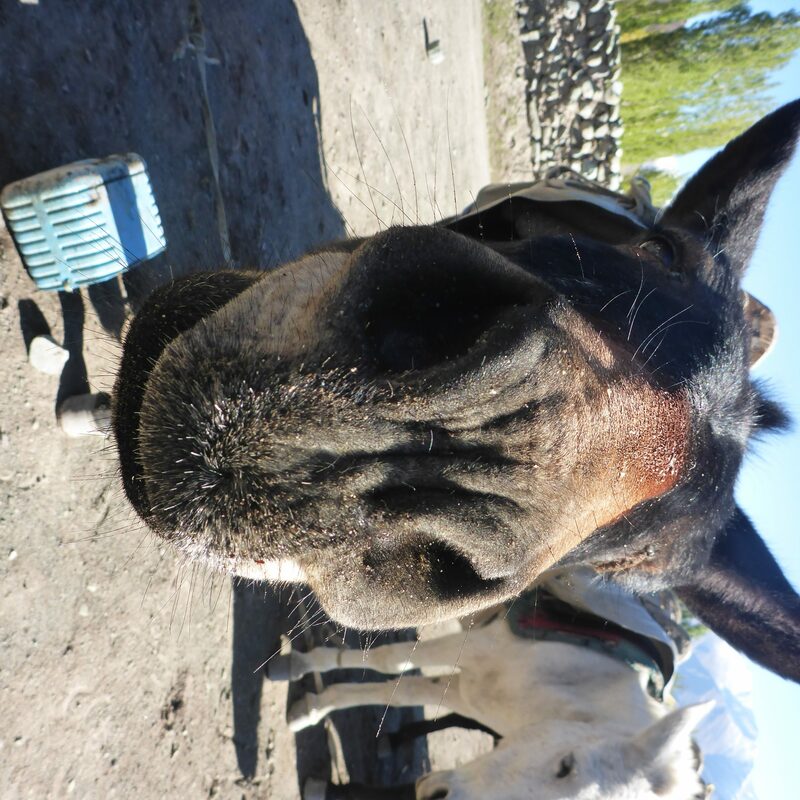 We would meet our Pony Men, Karma 2, Tenzin and Sonam, later on that day but in the meantime, lunch was to be had and then a wee walk up a small hill to stretch our legs. As we headed out for our wander the rain started to fall. Lightly at first but as the evening stretched into night the patter of rain drops on our tents grew stronger. A small amount of rain shouldn’t have been a problem, dampening down the dust which was due to greet us on our walk up the valley, but this was more than a small amount of rain. As we set out for our walk to Skiu the next day we crossed a stream which the day before had been a trickle and was now in full flow. My heart sank. Rain down low means snow up high and as we were due to cross two high passes in the next few days to get to our intended route to Stok Base Camp I had my fingers crossed that this rain would stop, that the sun would come out and that all would be well. Alas crossing my fingers had no effect. Briefing the group about keeping your safety minds switched on is always on the list in the Himalayas and on any mountain. Things slide down the steep sides of the valleys and it’s so important to be aware of your surroundings rather than to follow the person in front thinking that they have your safety sorted. Being an independent thinker where safety is concerned is something that I instil into my clients early on rather than them slipping into sheep mode. Our first stop for tea produced lots of chats with Karma, our local guide, and myself. As we sat in the kitchen of a local tea house, two 14-day old kittens on our laps and our group happily chatting outside under the protection of a tepee style tent, we talked plans. What would happen if this rain continued to fall? How would the valley up to Shingo be? Impassable or safe? How would our way out be if we needed to retreat? Planning, planning, planning. The rain kept promising to stop but just as we thought the last drop had fallen it then started again. This was not good. ‘It never rains here’ said Karma. We arrived in Skiu and I headed straight into the tea house in whose grounds we usually camp to check out our indoor alternative to soggy tents. This would be our haven for the next 48 hours and a fun, if not frustrating one, it was. The rain finally stopped overnight but left in its wake torrential rivers, unstable valley sides and much snow up high. Taking an early morning walk up the valley to check out the conditions, my heart sank, again. Briefing the group on day 2 of our expedition that our chances of summiting Stok were slipping away was a true kicker for all. This is the time when I should be writing that ‘it’s all about the journey’ and other motivational stuff but to be honest it sucked. My fabulous group took it well, they could see the situation we were in, and understood the environment in which we were walking, the safety of our entire team was paramount. We had already gone through Plan A (no water), Plan B (enough water), Plan C (too much water) and were hoping that 24 hrs of sunshine would allow us to continue with Plan D (an ok amount of water) and up the valley to Shingo early on Day 4. Day 3 was spent holed up in the tea house, drying out equipment, hoping that the hills and valleys would purge the water that had fallen. We read, slept, had guitar jamming sessions, ate and drank tea. I watched a series about The Brecon Beacons, we chatted, watched the cats come and go and rested. The following morning brought another day of sunshine and some hope. We left early and walked up the valley towards Shingo. The valley sides are steep in places and the river was passable, so we kept our wits about us and steadily made progress to more open ground and our lunch spot in the garden of another tea house in the village. As I looked up the valley to Ganda La I could see how just much snow had fallen up high. This, once again, made my heart sink. Talking to Karma about the possibilities of not only ascending this pass the following day but what about Stok La, our steeper pass the day after. If we had all of our technical kit we may have been ok but this was not an ideal situation at best. The ponies, however, had no chance and with no ponies, we had no kit, and therefore it was a no-go. Were we really going to head to Plan E already? 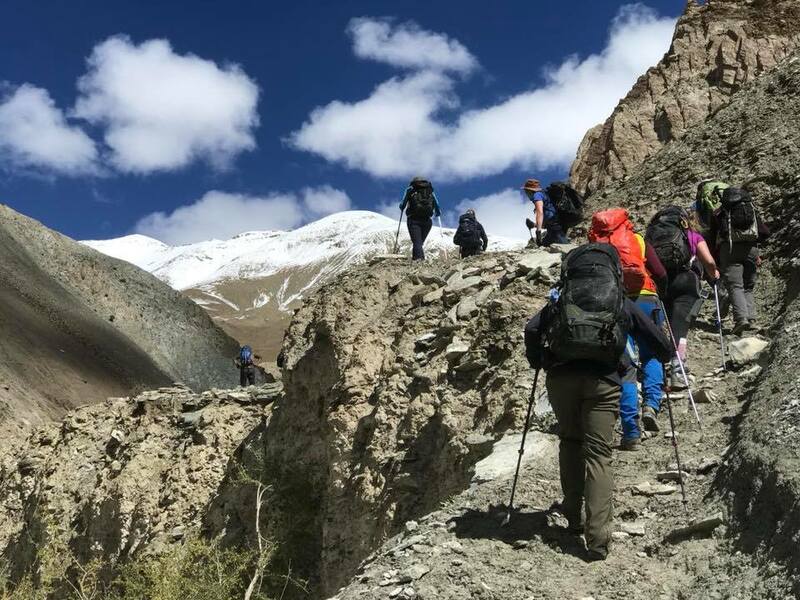 It was an audacious one which would mean ‘a bit of a walk’ for our Pony Men and their steeds to get around to Stok Village, the very long way round as Stok La was impassable. 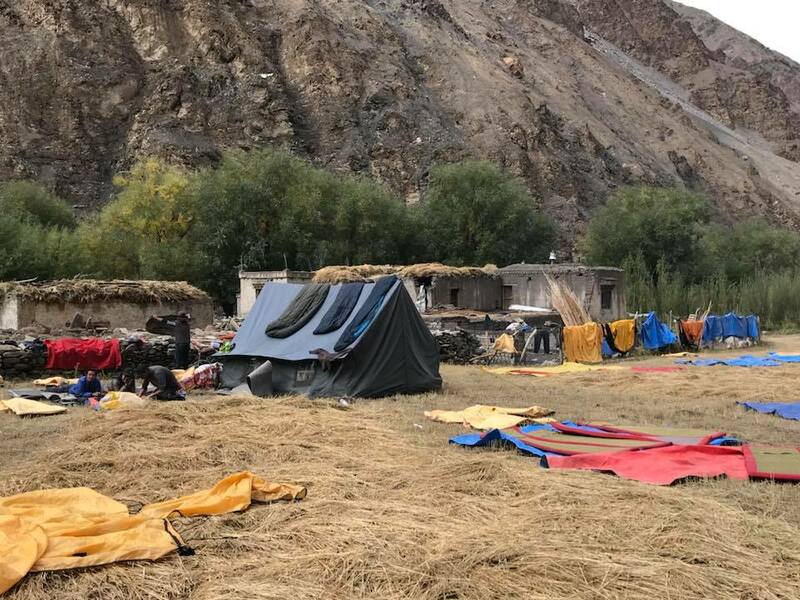 As I stood up in our mess tent in our beautiful camping spot at the base of Ganda La, I once again briefed the group about our imminent change of plan. They had guessed by the look on Karma’s face and his ‘ohhh noooo’ words when he saw just how low and how much snow had fallen. 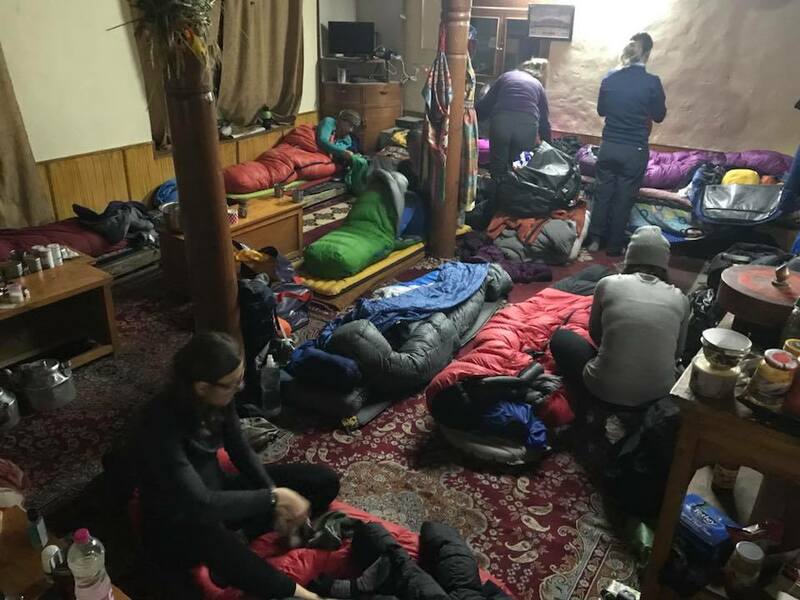 It didn’t mean that all bets were off though, we still had a fighting chance, but it would very much depend on the conditions of the snow on Stok itself and whether any other teams had managed to put a route back in. We weren’t giving up yet! The next day was a long one. 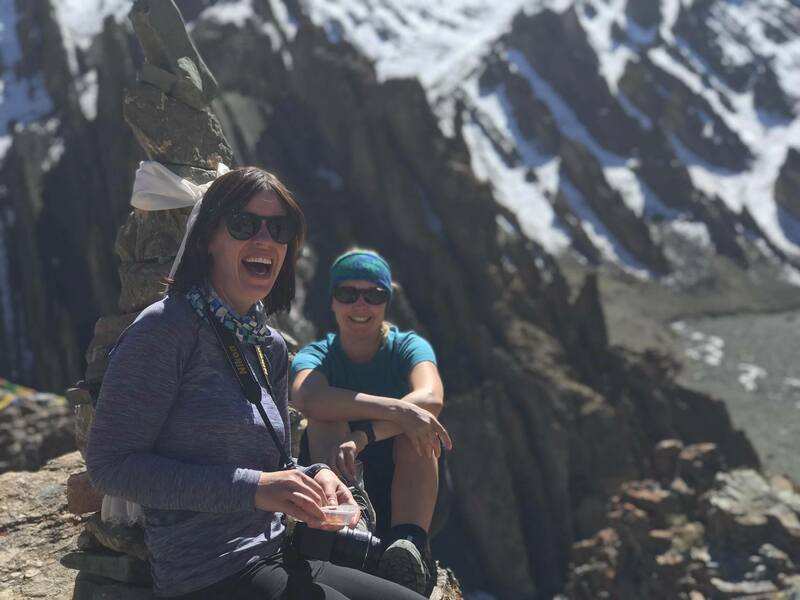 On our original itinerary, and even on Plan B, it was supposed to be a nice 5-hour day of acclimatisation over a high pass and a gentle wander into Ganda La Base as our other two 360 teams had done in the previous few weeks. 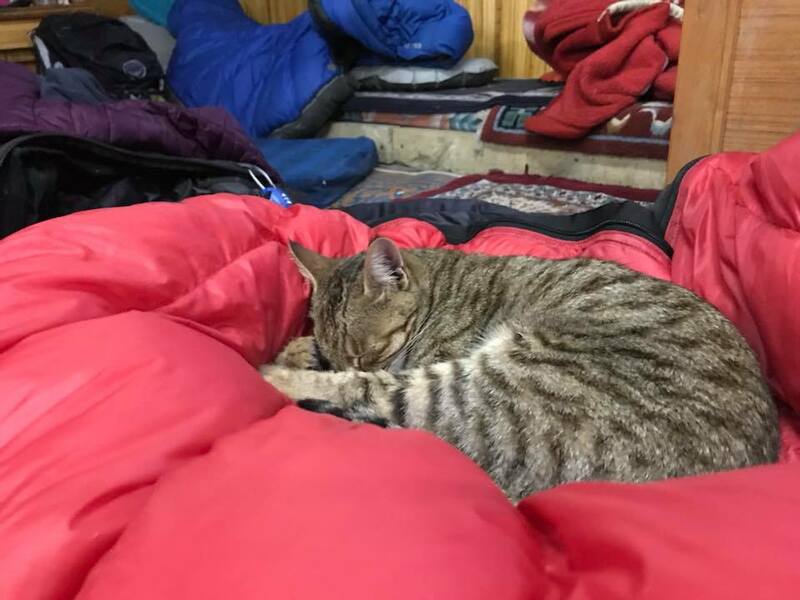 We had a rather longer day ahead of us, doubling the hours, as we needed to head right down the valley popping out at Zincheng to pick up our vehicles and then drive the hour or so around to Stok village. I was trying to work out the distance as we zig zagged our way out of the valley to then traverse around the bottom of the mountain. Our dear Pony Men, and their dear ponies, were walking this distance to be with us the following morning. This, to them, was normal. This to us was potentially saving our expedition. We owed them everything. As we arrived in our new camp in Stok village, two of our amazing team decided, understandably, to call it a day. The rigours of the terrain and the uncertainty of the plans had taken their toll so as we said a fond farewell the remaining members of our close-knit team settled down for another amazing dinner and a night of dreaming of melting snow and the chances of a summit. We were now on the direct route up to Stok base camp. 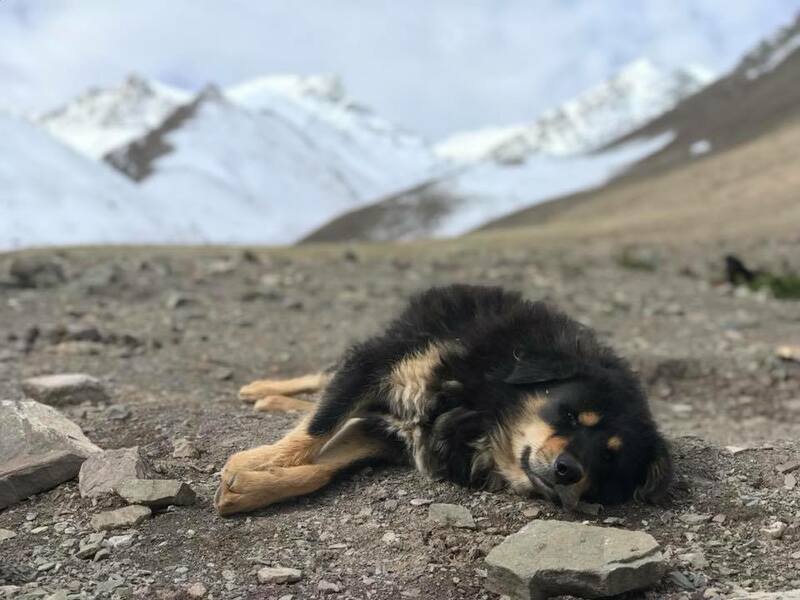 A route which is climbed too quickly by a large number of groups and from 3,600m in Stok, you could be standing at the summit of Stok at 6,153m in 3 days. Way, way too fast. We never do this route to ascend to Stok BC and prefer the journey (there it is again! ), a slower acclimatisation along the valleys and over the high passes, the peace and quiet of camps not often used, seeing marmots lumbering around, eagles soaring, shepherds tending to their sheep and villagers going about their business. As with all expeditions at altitude, acclimatisation is all important for this 6000m peak and is part of that journey (yet again!). However, despite our now straight up and down route, we had had great acclimatisation and were in a good place to ascend the way we were. The route up to Mankarmo, a basic camp sitting at 4,400m, was an easy one. I led the way, slow and steady, with a couple of chilled breaks along the way. ‘How do you know which route to take?’ asked Monica. ‘I just follow the donkey poo’ I replied! A few climbers passed us on their way down and the usual ‘did you summit’ questions were asked. ‘Nooooo’ said one Indian team. ‘Way too cold’. Another guide gave reports of thigh deep snow at Stok Base Camp and above and my heart just kept on sinking. I like to make my own decisions, based on what others say but by also seeing conditions for myself however I got the feeling that our chances were slipping away more quickly now. More plans were whizzing around my head as we settled into what was going to be our final camp. I had wanted to up-sticks the following day and head to lower Stok Base Camp and at least try to get up onto a small col en route to summit the following morning. Summit day is a long one in the of best conditions and we were far away from even ok conditions, so a Stok summit was now out of the question. I chatted to Karma and then our cook about moving up higher and once I saw the look on Topcheng’s face I decided that Plan F was a no-go and that we would settle on Plan G.
Plan G was the final one, I promised the group. 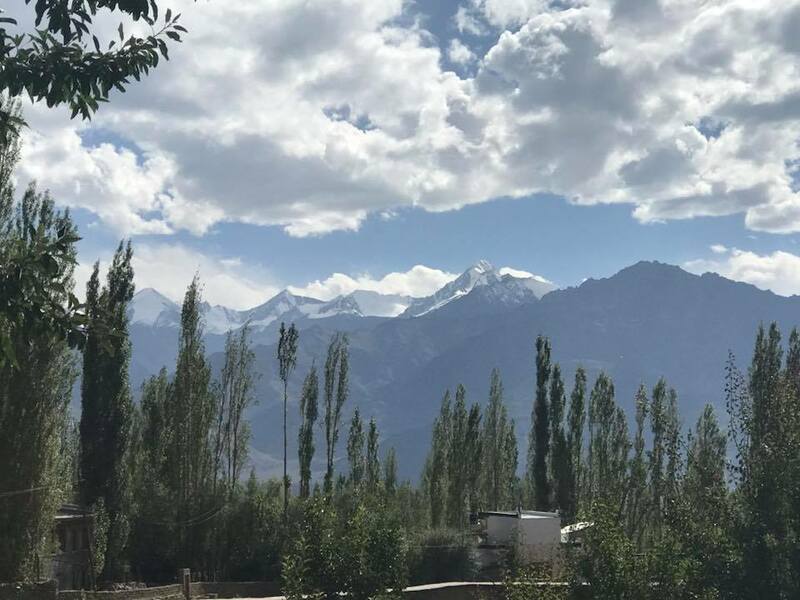 We had tried our best to get as close to Stok Kangri as possible, but we would have to view that summit from another peak, from our summit. It’s all about the journey, right?! Didn’t Judy Dench say in the Marigold Hotel ‘The only failure in life is the failure to try’ and boy we had tried? Our summit day had finally arrived and after a crampon/harness/ice axe fitting and training session we donned our packs and headed up the valley towards Golab, a 6,000m peak to the left of Stok Base Camp. We would get as high as time and the right conditions would allow and I had really hoped to top the 5,000m mark. 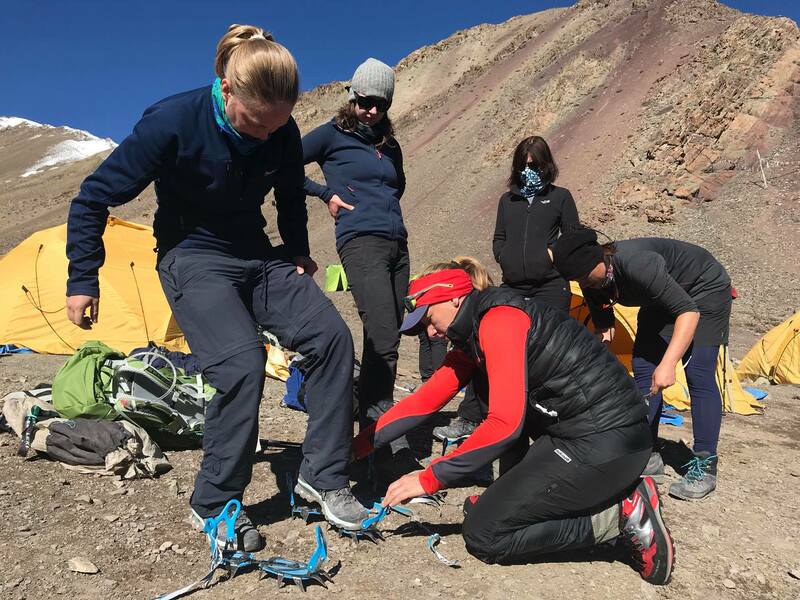 Once we hit the snow line and the start of our chosen peak crampons were strapped to our boots, harnesses checked, rope teams sorted, and we were off. Our start was up a short and steep climb away from the flowing streams of meltwater. ‘The rope should be kissing the ground guys’ I had said before we set off, the fundamentals of walking on a rope is all about teamwork, looking out for each other and gauging what the person in front is doing, just like driving a car and keeping 2 chevrons distance between you. This, for many of the team, was the first time they had used more technical equipment, but our terrain was very forgiving, and we had chosen this peak just for that reason. A good start point for the wintry stuff and once the rope teams got into their strides they moved well. Ritzen was up ahead breaking trail for us and although this particular route was not too deep with the snowy stuff it was still tough work. We got to ‘Thinking Rock’ where Jane decided she had reached her summit and having dropped some packs and had some food the rest of us then carried on up to our summit point, a cairn at a little over 5,000m. Reaching this high point was a bitter/sweet moment. We looked across at the summit of Stok Kangri, so close but also a million miles away and thought about what could have been. However, as we all know, a summit is never guaranteed no matter what and dear Mother Nature had her final say on this one. 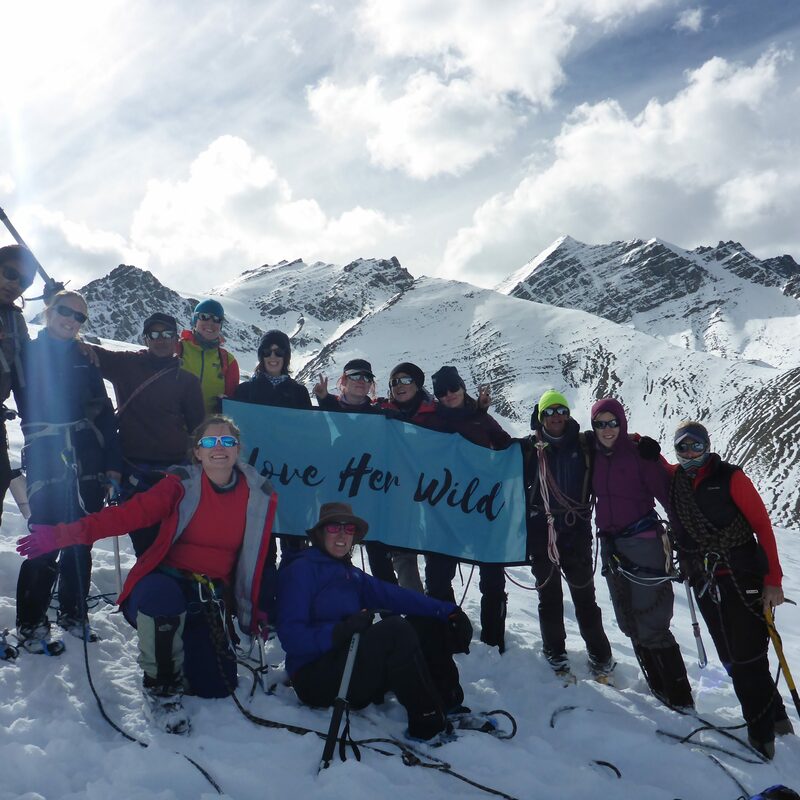 Safety, Fun, Summit is a great mountaineering mantra and is so true. 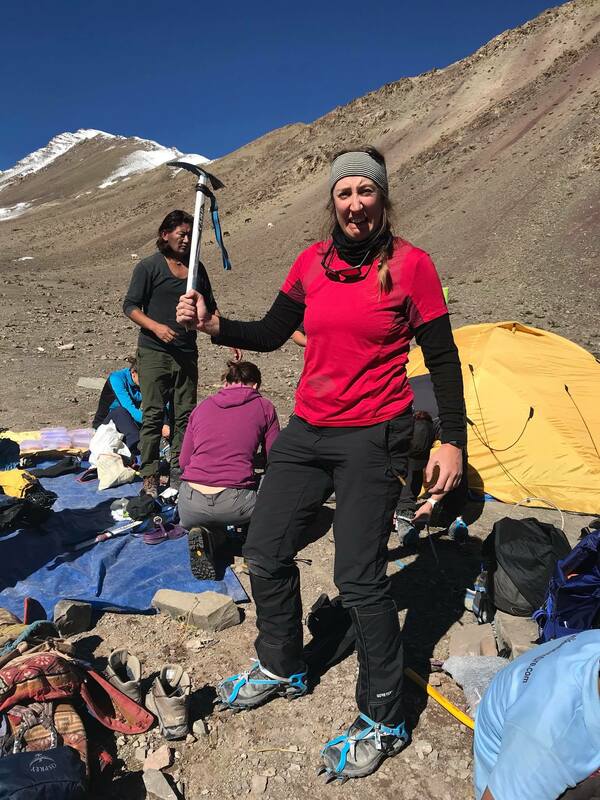 Whether the summit for some team members had been on the Ganda La at 4900m or here at 5,050m on the slopes of Golab we all had our own special experience and would all come back home safely with great stories to tell. 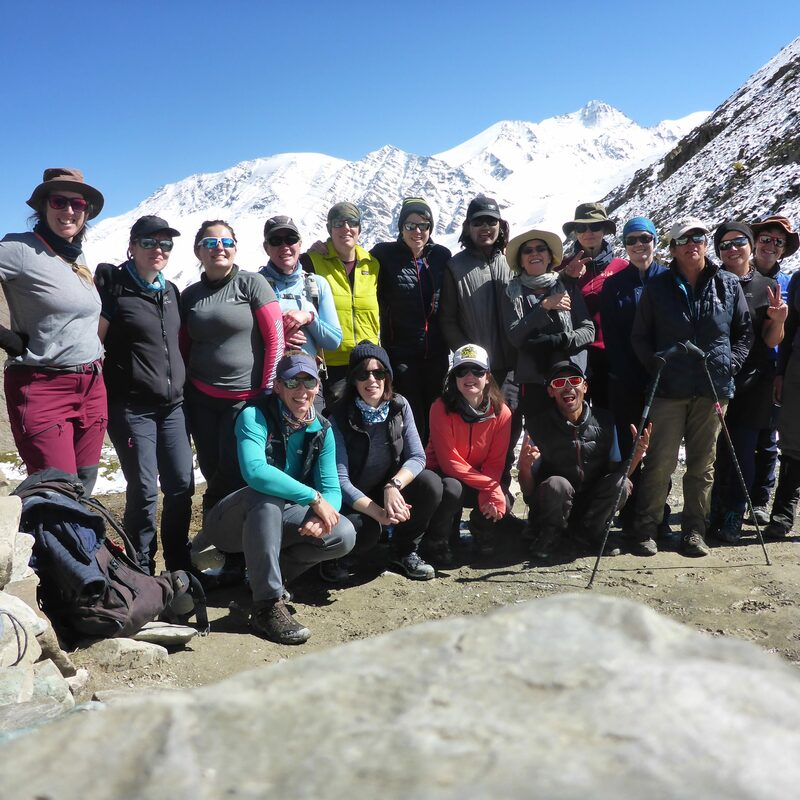 A truly fantastic expedition with a truly fabulous team, trekkers and crew alike. We laughed a lot, talked a lot, supported each other and had been through a bit of a rollercoaster of emotions on our slide down the alphabet but here we were, at our own personal high point and we were proud of that. My team had trained hard, saved hard and worked hard for this expedition but we definitely took it all in perspective when we saw how Mother Nature had wreaked her havoc farther south from us. All in all, we were lucky with what she had given us. Junko Tabei, the first woman to reach the summit of Mt Everest back in 1975 (her book Honouring High Places can teach us all a thing or two about tenacity and leadership), and pioneer of women’s expeditions in Japan back in the 70’s, said ‘I found it difficult to hear people crush their dreams with the word ‘but’. For us, there were no ‘buts’. We turned ‘Can I?’ into ‘I can!’, expanding the teams ‘normal’, teaching and learning new skills, making new friends and logging memories of a very special expedition together. Photo credit to Bex Band from Love her Wild.